Chamba City was founded in 920 AD by Raja Sahil Varma who named it after his favorite daughter Champavati. 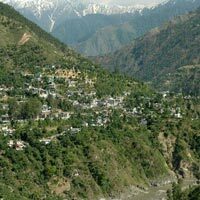 Counted as the most reputed Chamba City Guide in the state, we arrange highly congenial Chamba Tour to the tourist. Chamba Tourism is known for its diversity in context of sight seeing the city offers. Surrounded by lofty peaks and lush green ecology the place is an ideal destination for spending a quite holiday with your loved ones. Travel to Chamba will give you a chance to see the famous places like Lakshminarayanan Temple, Bhuri Singh Museum, Chaugan and Chamunda Devi Temple and so on. The Lakshminarayan Temple, the oldest in the group of six ancient temples carved in stone, and is richly ornamented. Dedicated to both Shiva and Vishnu, they were built around the 8th century AD. Bhuri Singh Museum has a rich collection of fine miniatures from the Kangra, Basholi and Chamba schools of painting. This large grassy pasture is in the center of the town its cultural activities. Each year a vibrant Minjar Mela is celebrated here. Hari Rai Temple is 11th century temple located near village Chaugan, which has a bronze image of the Chaturmurti - the four armed Vishnu, enshrined in the sanctum. It is a popular place of pilgrimage 30 Km away from the city. Sarol is a lovely landscaped garden and also a sheep breeding centre.